UN’s recent Palestine conference: Guide to the video! 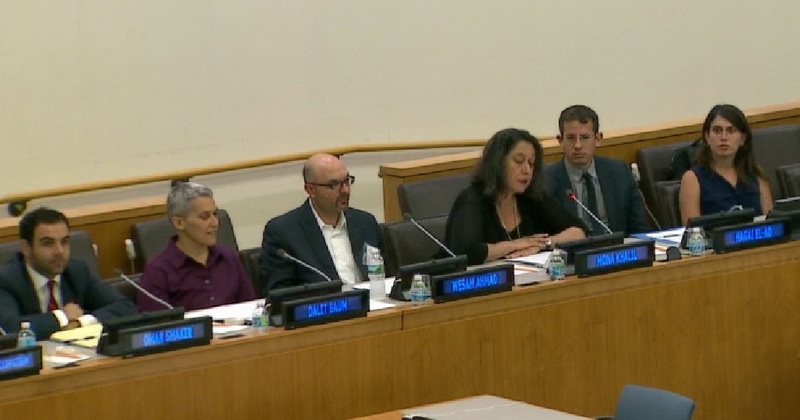 On June 29 and 30, the UN’s Committee on the Exercise of the Inalienable Rights of the Palestinian People convened a highly informative conference in New York to mark the 50th anniversary of Israel’s occupation of the West Bank (including East Jerusalem) and the Gaza Strip. The conference brought together political leaders from Palestine and elsewhere and (especially on the second day) leading thinkers and activist on the issue including law professor Noura Erakat, rights leaders Wesam Ahmad and Hagai El-Ad, Palestinian parliamentarian and grassroots leader Dr. Mustafa Barghouthi, and the head of the US organization Jewish Voice for Peace, Rebecca Vilkomerson. My report on the first (more formal) day’s proceedings is here. Now, however, with admirable speed, the UN’s videographers have posted excellent videos of the whole proceedings of both days of the conference, so people everywhere can share the experience of those of us who were lucky enough to be at the conference. As you can see there, most of the videos contain the records of more than one part of the conference, but the listings on that portal page handily tell you where in each video to find the panel you’re looking for. 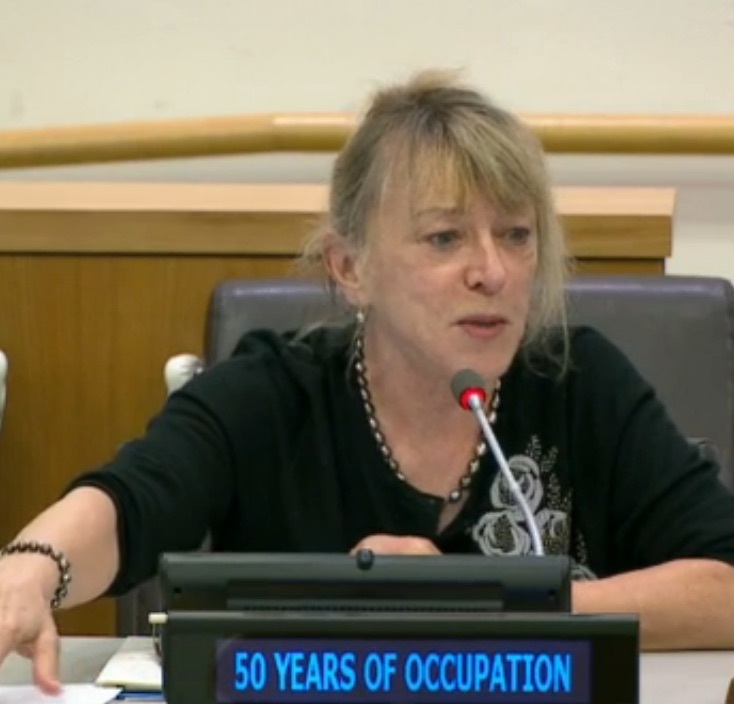 On June 30, the Keynote Speech was given by Nobel Peace Laureate Jody Williams (see at left in the screengrab here.) She drew on her experience as the coordinator of the International Campaign to Ban Landmines, which was overwhelmingly an effort led by civil-society organizations, to provide some helpful pointers for how civil-society groups working around the world could become more effective in pushing for an end to the occupation and the realization by the Palestinian people of their inalienable rights. Ms. Williams’s speech was followed (at 00:54:00 on the same video) by a very rich, two-hour panel on Gaza. This panel was supposed to include two leaders from community-based organizations in Gaza, Majeda Alsaqqa of the Culture and Free Thought Association and Mohammaed Azaiza of Gisha. They had, however, been unable to secure the “permission” of the Israeli occupying authorities to leave the Gaza Strip, so they participated in the conference only over a voice-phone link. Mr Azaiza talked with anguish about having gotten caught up along the way to the UN office from where he was speaking, in a crowd of thousands of families going to spend a day at the beach– while he (and probably most of the adults in the families) knew that the beaches are horribly polluted with raw sewage that cannot be treated because of the extreme cut-back of the electricity required by the water-treatment plants that serve Gaza’s 2 million residents. Ms. Erakat spoke eloquently about the fact that the catastrophe visited upon Gaza’s people is not the result of a natural disaster, but is entirely human-made. The remedy must therefore, she concluded, be found not just in the realm of humanitarian “aid”, but also in the realms of politics, diplomacy, and international pressure on Israel. Ms. Oswald talked about the many different ways in which Israel’s policies violates the basic human rights of the residents of Gaza. This panel was complemented with a very informative discussion among the panelists and attendees in the “floor” of the conference hall. In the course of this discussion, Ms. Erakat expressed some skepticism about the value of relying on some eventual case being brought against Israel for its abuses at the International Criminal Court. She argued (at around 01:56:00)that there are already other mechanisms through which states that want to curb Israel’s abuses can act including by following through on the recommendations made by the fact-finding mission that the UN had sent to Gaza after Israel’s 2008-09 assault on the Strip, or by following the recommendations of the International Court of Justice’s 2004 advisory opinion on many aspects of Israel’s occupation policy. The second panel of the day was titled “Enforcement of International Law and Accountability: How to Make a Difference?” The video is here. This panel featured (from left to right in the photo) Omar Shakir of Human Rights Watch, Dalit Baum of the American Friends Service Committee, Wesam Ahmad of Al-Haq, panel moderator Mona Khalil, Hagai El-Ad of B’Tselem, and Muna Haddad of Adalah. 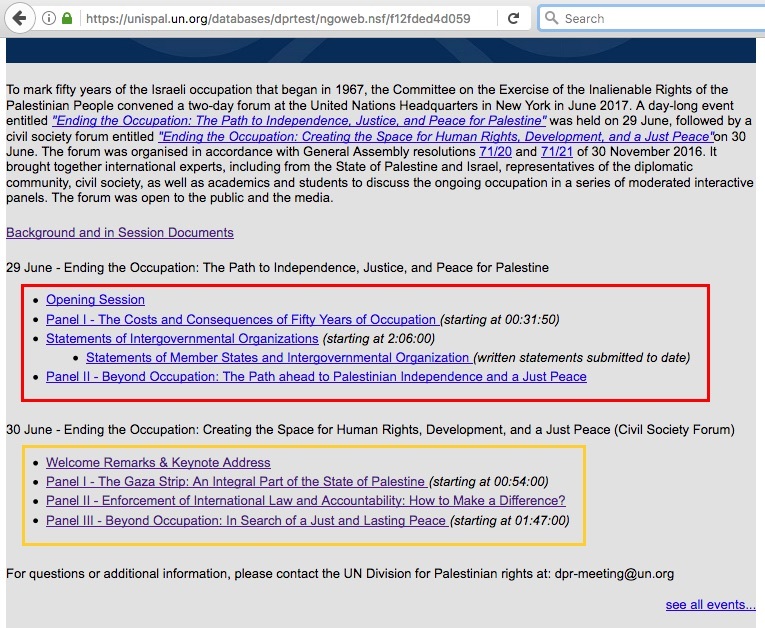 The third panel of the day was titled “Beyond Occupation: In Search of a Just and Lasting Peace.” It starts at 01:47:00 in the same video. This was the panel of which I had the honor of being the moderator. The panelists were, in order, Dr. Mustafa Barghouthi, Rebecca Vilkomerson of Jewish Voice for Peace, David Wildman of the United Methodist Church, Jessica Nevo of the Coalition of Women for Peace (Israel) and also Zochrot, and Diego Khamis of Club Palestino in Santiago de Chile. 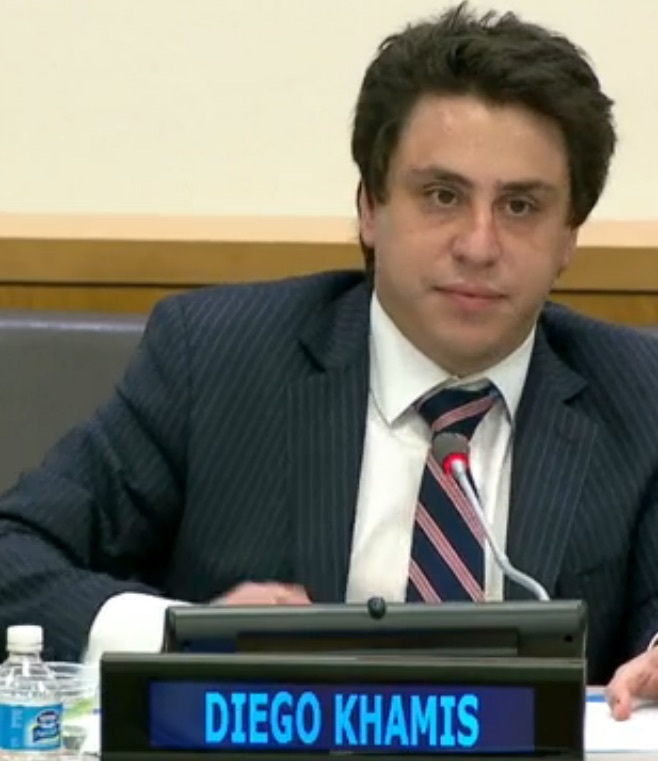 Mr. Khamis didn’t appear in the screengrab above, so here he is at right. He brought a welcome voice from Latin America to the conference. Both the second and third panels of the day included substantial discussions involving both panelists and other attendees of the conference, of the tactic of Boycott, Divestment, and Sanctions. Both panels are very well worth watching. Big thanks to everyone at the United Nations who organized this conference– though the occasion for it, that is, the 50th anniversary of Israel’s military occupation of Gaza and the West Bank, was truly a sobering one.